Protect your equipment and keep it organized at the same time. 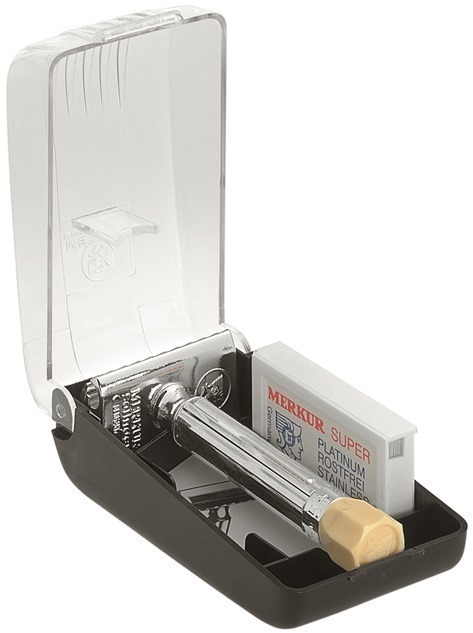 This compact package includes a Merkur Progress #500 adjustable double edge safety razor, a 10 pack DE Merkur blades, and a plastic storage case. With an adjustable double edge razor a twist of the bottom knob raises or lowers the pitch of the blade to give you a custom shave. Case size: 3 5/8" X 2 1/4" X 1 3/8"